UNITED NATIONS, February 19 -- Susan Rice, the US Ambassador to the UN, accused the UN's humanitarian coordinator for Somalia Mark Bowden of "misconstruing" US restrictions on aid. 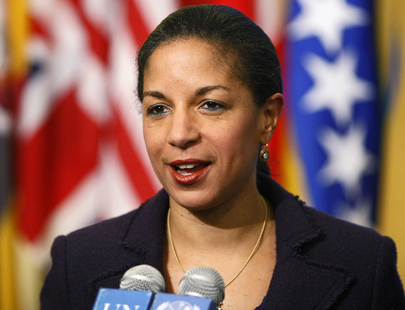 Ambassador Rice asserted a "diversion of resources" to the Islamist group Al Shabab. Since it is on US terrorism lists, US law requires the restrictions the US is demanding. But what are these U.S. restrictions? Bowden, while publicly complaining about them, would not provide any description. Rather, he said that when he went to Washington to discussed them with US aid officials, they told him the issue was "above [their] pay grade." Inner City Press asked Ambassador Rice about precisely this quote. She insisted that it is Al Shabab which is responsible for the lack of aid. Video here, transcript below. But what of Bowden's quoting of US aid officials? A US State Department official in Washington, described as "irritated," has said of Bowden, "We're going to talk to him." The quote reminded on UN observer of "something from the Sopranos," or the Mafia film "Good Fellas." When Bowden's boss, top UN humanitarian John Holmes, stood before a UN microphone on Thursday evening, Inner City Press asked him to explain what Bowden had said, and to describe the US restrictions to which the UN is publicly taking exception. But Holmes responded that the message was only that the UN needs more funds. Even pressed, he declined to follow or back up Bowden. Video here, last question. Was this "good cop, bad cop," an observer mused afterwards. Or was Holmes showing his political stripes, declining to criticize the U.S. as, for example, his predecessor Jan Egeland did after the tsunami? Following Ambassador Rice's two responses to the Press about Somalia, she went in to a Security Council meeting about Haiti. Speaking first, from a prepared text, was the UN's John Holmes. So goes diplomacy at the UN. Footnotes: While Ambassador Rice also took two questions about Iran's nuclear program, the Press was not able to ask for her views on developments in Sudan and Darfur, or on anti-democratic moves in Niger and Cote d'Ivoire, nor the incorporation of a presumptive war criminal into Guinea's interim government. But the answers on Somalia, although of a piece with Washington's script, were appreciated. Thursday a UN official told Inner City Press that "Susan Rice, as an expected future Secretary of State, is playing it safe. She will not, for example, criticize [former South African president Thabo] Mbeki about Sudan." Until questions are asked, and answered, we'll stick to an open mind. Inner City Press: On Somalia, the U.N. has said that the U.S. is politicizing aid, and has made restrictions that make it impossible to feed people in southern Somalia. Could you say what the restrictions are and what the reasons for them are? Ambassador Rice: Well, first of all we utterly reject that claim; we think it's false and unfounded. The reason why aid is not now proceeding to the people of southern Somalia is one reason alone and it's quite clear: it's Al Shabaab's attacks on WFP and other U.N. agencies, its kidnapping of innocent relief workers, its extortion of funds which prompted WFP on January 5th to take the decision that it could not and would not continue to deliver life saving assistance in southern Somalia. That's an unfortunate development but it is a direct consequence of Al Shabaab's attacks and efforts. The U.S. is the largest donor of humanitarian assistance to Somalia, we have been consistently over many years, and in 2009 we contributed $150 million in humanitarian assistance to Somalia. So, as I said we reject that claim as false and unfounded. Inner City Press: One follow up, Mark Bowden of the UN had said when he traveled to Washington and met with USAID officials they said to him that the decision was above their pay-grade and was being made by the State Department on a political basis. Ambassador Rice: He's conflating and misconstruing two different things. The reason why the people of Somalia in the South are not able to receive the assistance that we and others have traditionally provided at present is because WFP took a decision, a decision they felt compelled to take and we understand why they had to take it, that they could no longer continue to provide assistance safely, given Al Shabaab's harassment, attacks, and terrorist activities. The question of how the U.S. government has responded, and we have been in discussions with humanitarian delivery agencies about the fact that we have grave concerns about the diversion of resources to Al Shabaab and other terrorist organizations in contravention of U.S. law. And we have had those discussions, they have been ongoing but nonetheless, the U.S. provided $150 million of humanitarian assistance to Somalia last year. We remain, as we have been for many years, the largest donor, and what is precluding the delivery of assistance to people in southern Somalia is Al Shabaab. 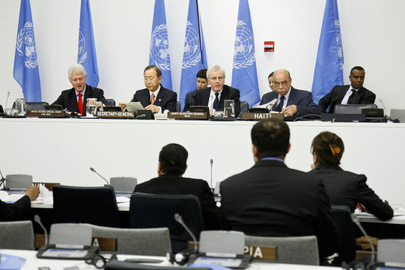 UNITED NATIONS, February 18 -- In Haiti, the UN's Force Commander Major General Floriano Peixoto Vieira Neto, has been aware of "incidents" in which the Haitian National Police have killed civilians. Inner City Press asked him about it on Thursday. Video here, from Minute 13:56. He said, "those were crucial and critical moments, the HNP needed to use that kind of force." Video here, from Minute 15:56. It is reported that President Rene Preval, his prime and other minister met in January and authorized the summary execution of "criminals." The UN Stabilization Mission in Haiti, MINUSTAH, which has a stated and implicit duty to protect civilians, has confirmed it has been aware of killings. Inner City Press asked the Major General what his troops do about this. "I do not command the police," he said. "I do not speak on this." This seems to be a major problem. Even those the UN peacekeepers are changed, according to the force commander, with security and not criminal justice, if they witnessed one civilians killing another they would act. But if Haitian National Police kill someone, even as a summary execution, the UN says and does nothing? Later on Thursday, Bill Clinton was scheduled to join a press stakeout with Ban Ki-moon, John Holmes and Haiti's Ambassador. But Clinton was delayed, due in part to an anthrax scare at the UN -- click here for Inner City Press' first and second stories -- so he skipped the stake out. Mr. Ban took only one question before leaving. Inner City Press asked Haiti's Ambassador about a meeting between President Rene Preval and US contractor Ashbritt, to gain rubble removal contracts. He replied no contract has yet be let, and whoever wins must create jobs. Afterwards, he thanked Inner City Press for not asking about the HNP's alleged executions. John Holmes dodged questions, first about his leaked email about Haiti, then about restrictions on UN aid in Somalia being imposed by the US. We'll have more on this.